Hi there everyone!! I just thought I’d post real quick today to share what’s on my nails. I feel like it’s been forever since I wore this polish! 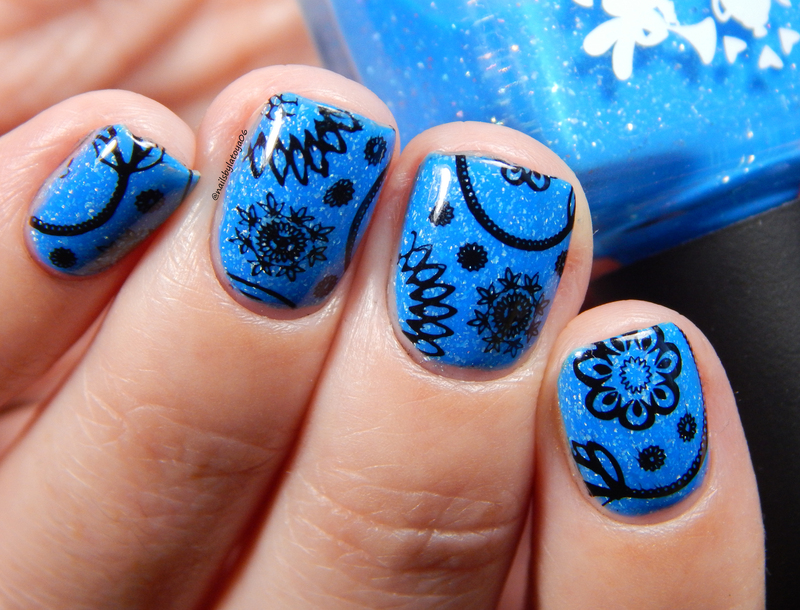 Picture Polish Alice is a bright blue scattered jelly holographic. Everytime I see this shade it makes me smile. It’s definitely perfect for summertime! For the stamping I used QA61 plate. I really love all of the arabesque inspired designs! Also, if you’ll notice, my nails are once again squares. I’m hoping if I keep them as super short squares they won’t chip on the corners. What do you think of this shade? Is this something you’d wear this summer? Thanks for reading today and I’ll talk to you all soon! This entry was posted in Beauty, Nail Art and tagged beauty, Indie, makeup, Manicure, Polish. Bookmark the permalink. ← Born Pretty Store Stamping Plates review! This polish is gorgeous! Your stamping is so crisp, too! I have this shade too, I really should use it more! You should!!! I’m trying to cycle through some of my more unloved shades that I’ve only wore one time.